The Umbrella Academy, Netflix's adaptation of the idiosyncratic Dark Horse comic from Gerard Way and Gabriel Ba, isn't your typical superhero story. Far from the big team-ups of Marvel and DC, this story follows seven kids with uncanny powers who were adopted by an eccentric, uncaring patriarch and grew up to be quirky misfits. Suddenly reunited by the death of their father, the strange siblings of the Hargreeves family - Spaceboy, The Kraken, The Rumor, The Seance, The Boy, The Horror, and The White Violin - find themselves tasked with somehow saving the world from impending doom. Speaking with our sister publication SFX magazine, producer Steve Blackman, whose credits include Altered Carbon, Legion, and the Fargo series on FX, raved about the ensemble cast he assembled to play the Hargreeves. "I had a really good idea of everyone I cast," says Blackman. "I got lucky. I got a lot of the people I wanted. And together, they just had this really real relatable family [quality]. They're so real together... you buy them as a family. All the stories feel so relatable to me when they're all together." Though the Hargreeves' father was emotionally cold - "He saw them as tools that one day would save the world," says Blackman - they weren't completely left to their own devices. Sir Reginald Hargreeves constructed two caretakers to watch after the children, including Dr. Pogo, a talking chimpanzee brought to life for the show by Weta Digital, the same VFX studio behind the recent Planet of the Apes franchise. And Blackman was able to lean on an experienced mo-cap actor to help guide the cast on how to act across from an absent CG ape: Ellen Page, who plays the seemingly ordinary Vanya, The White Violin. You may remember that Page also starred in the PS3 and PS4 game Beyond: Two Souls, the supernatural drama from Quantic Dream that relies on mo-cap for the performances that drive its gameplay. "She was an old hand, so she understood everything about how to do it, how to talk to this person, how to look," says Blackman. "She had done some of this stuff before. Motion capture and fully CG animated characters was not a new thing for her. I think the level of quality of what we did was new but she understood it." The Netflix version of The Umbrella Academy will tell the story of the graphic novel's two existing volumes, but a third is currently in the works at Dark Horse. "They're moving forward," Blackman confirms. "They hadn't put out a new volume of the comics for nine or ten years. But now with the excitement of the show coming, they had always planned to do another volume of comics. So they've begun... that's exciting for the comic world and their fans." 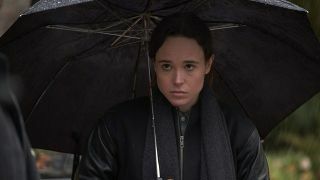 We'll see how The Umbrella Academy plays out when it hits Netflix on February 15. You can read more about The Umbrella Academy and more TV shows and movies coming this year in the latest issue of SFX magazine. If you're interested, you can subscribe ASAP so you never miss an issue.